GUANGZHOU, China, Oct. 11, 2018 /PRNewswire/ — GAC Motor, China’s leading automobile manufacture, has defended its title as the highest-ranking Chinese brand in the latest J.D. 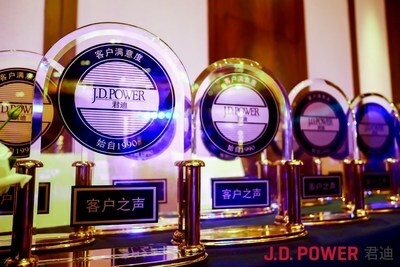 Power Asia Pacific China Initial Quality Study (IQS) for the six consecutive years. 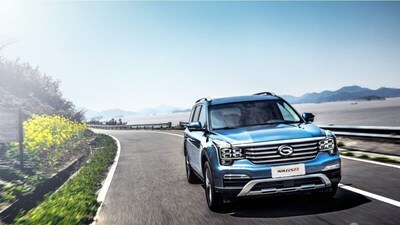 Included in the rankings, GAC Motor’s GS8 earned the top spot in quality in the large SUV market segment. The J.D. Power’s annual IQS report is a market indicator of vehicle quality, recognizing top-performing automobile brands and products through the evaluations of tens of thousands of consumers. GAC Motor has maintained its spot as the top-ranked Chinese auto brand for the sixth consecutive year. This recognition by J.D. Power Asia Pacific demonstrates GAC Motor’s consistent quality of products and services, and affirms its status as a leader in the Chinese automobile industry. 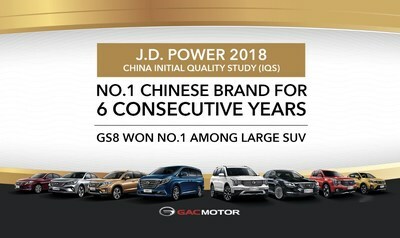 In addition to its top ranking on the latest IQS, GAC Motor also received the highest score (653) for the second year in a row on J.D. Power China’s 2018 Sales Satisfaction Index (SSI) in July, confirming the brand’s leading product quality as well as high sales and service standards. Since the company was founded 10 years ago, GAC Motor has placed strong emphasis on the four qualities that enable the company to pursue high-quality products that transcend customer expectations­­­ – attractive quality of design, reassuring quality of auto parts, reliable quality of manufacturing and heart-warming quality of services. To achieve these, GAC Motor closely collaborates in-depth with 18 strategic core supplier partners around the world in areas such as auto parts, product development, technology sharing, cost control and market expansion. The brand is supplied by the world’s top vendors including Bosch, Denso, Continental, Aisin and Magna, guaranteeing the quality of GAC Motor’s global auto part supplies, cutting-edge techniques and quality management system. GAC Motor runs a strict quality control system with the goal of achieving “zero defects,” covering all links in vehicle manufacturing from design, production, logistics, sales to aftersales services. Through elevating the company in all perspectives from products to branding and services, GAC Motor will continue to focus on the strategy of continuously improving the operation and management, and is well on its way to becoming a world-class brand and a global company.